Is your current situation something like this? 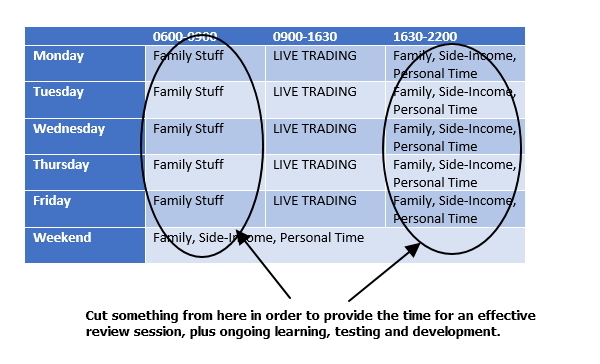 I know there is a LOT to be learnt through live trading. But it's the review process which drives growth and development. 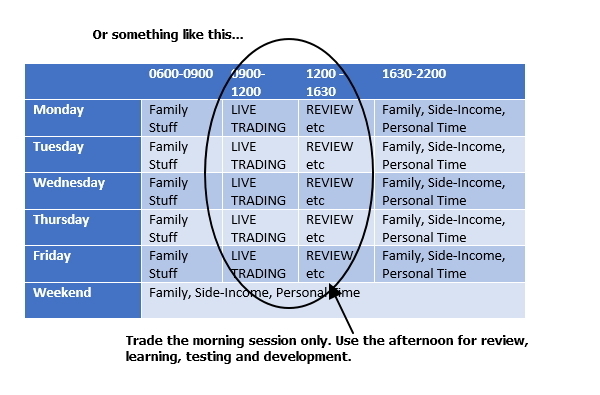 You'll see things during a review session, after the fact and away from the emotion, which were not visible in the live market. You'll discover things within your stats, which were not visible in the live market. If you want to progress, time for an effective review session is NOT negotiable. 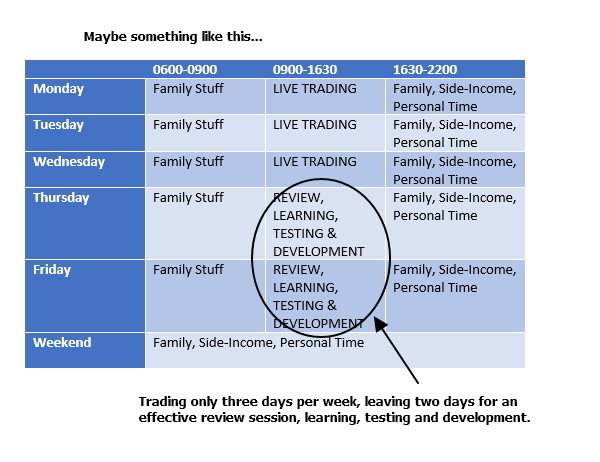 You either HAVE TO cut something from the time outside of trading, to allow for an effective review session and ongoing learning. 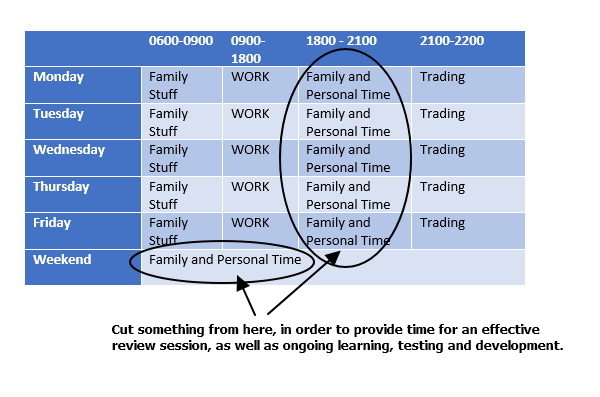 If you want to progress, time for an effective review sessions is NOT negotiable. We all want to trade more. But if you're not yet consistently profitable, or not yet achieving the standards of success you believe you are capable of achieving, then your priority must be ensuring an effective review process as well as time for learning, testing and development. 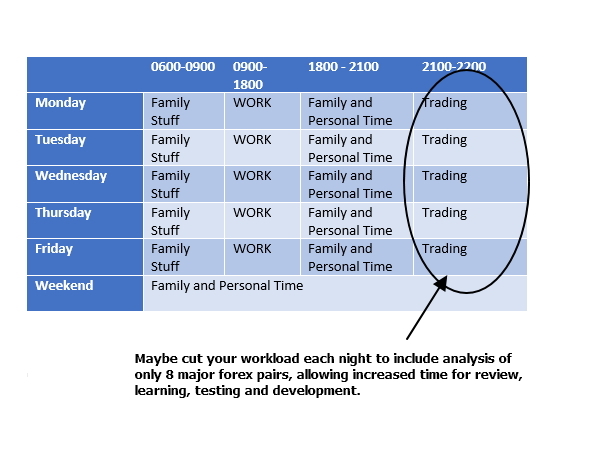 You can always trade full-time again in the future. But for now, less is more. Thanks for your nice advice. Every weekend, I read your articles, watch your you tube videos. But I cannot success in trading. Though I have identified my entry area. But afterwards, it goes to wrong. And I feel at that moment my entry setup area was wrong. Please advice me how could I get rid of this situation and get consistent profit in trading. Another question, If I gain in a trade, afterwards, it is going to loss too soon. I sell that share in losing price hoping it will drop more. I am following share business for long 12 years. But I cannot still find its way of profitability. I’ve checked the sales records and you don’t have the YTC Price Action Trader. There is little I can do then with no knowledge of how you’re trading. But this is the whole point of the article. It’s the work you do outside of trading which drives your growth and development. So after 12 years you’re not finding any progress. To grossly simplify the problem, it’s either (a) your strategy does not provide edge, or (b) your implementation of the strategy destroys the edge. This will need to be the initial aim of your review. Is this a strategy problem? Or a problem with implementation? Beyond that, there is a whole lot of work still to be done. But that is STEP ONE. thank you so much for all your excellent posts! I particularly enjoy the ones on the meta-game of trading. They have helped me a lot! 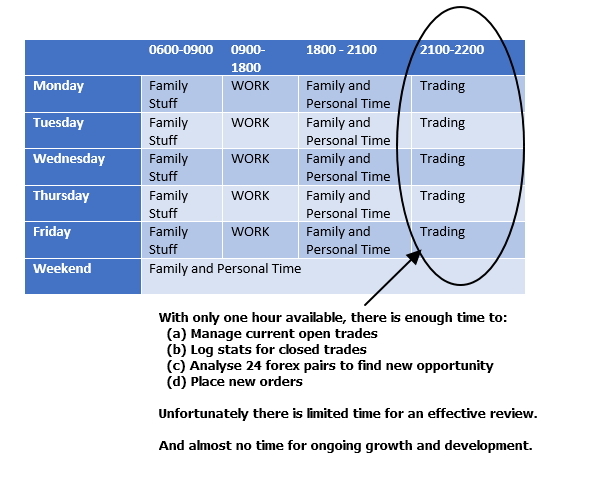 What ratio would you recommend for the time spent trading vs. reviewing (for day traders)? And does this ratio change as one progresses as a trader? 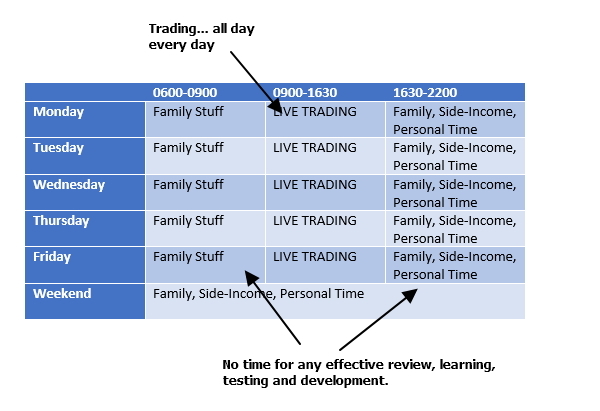 What ratio should day traders have for time spent trading vs reviewing? I probably average around 1:1. Some days a little less review. Some days a little more. Plus weekend study on top of that. It really is this important.